When we found out I was pregnant, we decided that rather than moving to a larger home, we'd stay in our 2BR 2BA apartment. We have plenty of space (1200 sq ft! ), so we felt like it would be better to stay put and save money for now. That said, with all of our family out of state, we wanted our 2nd bedroom to be a dedicated guest room for extended grandparent visits. 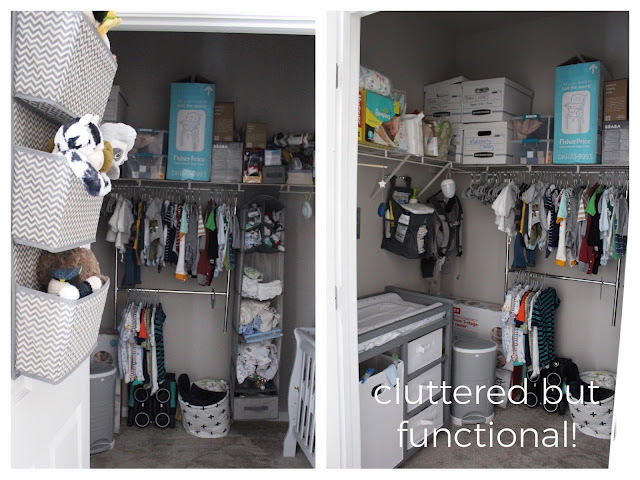 So we decided to share one walk-in closet in our bedroom and turn the other into our nursery. I've had a lot of friends curious about our "closet nursery" so I decided to share it here. That said, it's not going to be one of those lifestyle photo shoots, just a completely functional peek into our life with baby! Outside of the nursery, on my side of the bed, we added a rocker, my Christmas gift from my mother-in-law. We got it via Amazon, carefully looking for a smaller rocker that would fit that specific space. We also got a ton of baby books from folks too, which wouldn't fit in the over-door hanging storage I got. 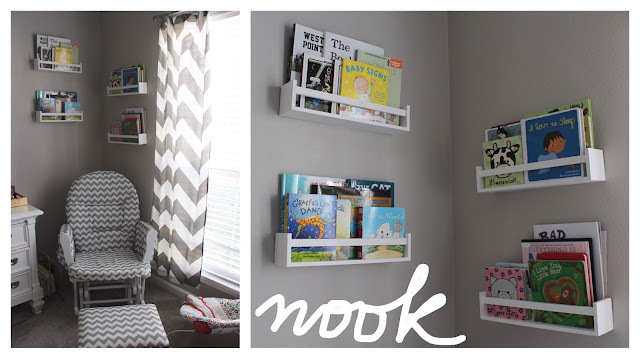 So the wall above the rocker became a baby book nook with display shelves, and the over-door hanging bins became storage for stuffed animals. Inside the nursery, we were fortunate to have a great space and some closet shelving to work with. For obvious reasons, we kept the shelves above the crib empty, but I felt confident in the strength of the shelves to store diapers above our changing table. After all, baby isn't to be unattended on the changing table! We also love having everything we need for the baby in one main spot, organized so we know where to reach even when we're tired. Kenny loves the mobile above the changing table too. Since I took these photos, I've filled up the bottom clothing rack with 3-6 month clothes! 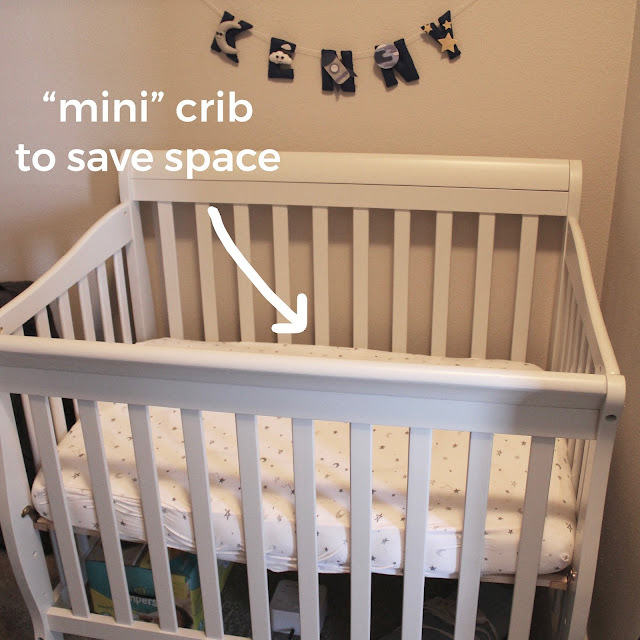 We also chose a mini crib because of the space, and Kenny sleeps in it every night! It's shorter than a full size crib, and about four inches less wide. The space is the size of a pack 'n' play basically. We've also got baby "stuff" in other areas of the apartment, but we try our best not to let it take over the whole space! I think that once Kenny is bigger, that will be tougher... but for now, it's not so bad! 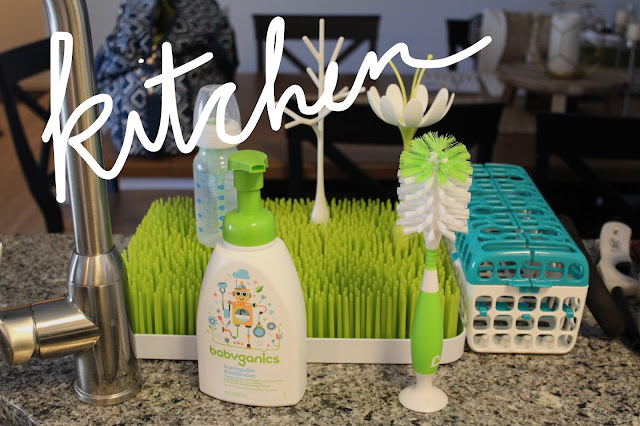 We have a mini dishwashing/drying station by the kitchen sink. In the living room, we have two bins under the coffee table that hold books and toys that we use for the day. We also have a little foldable swing and Kenny's activity mat. 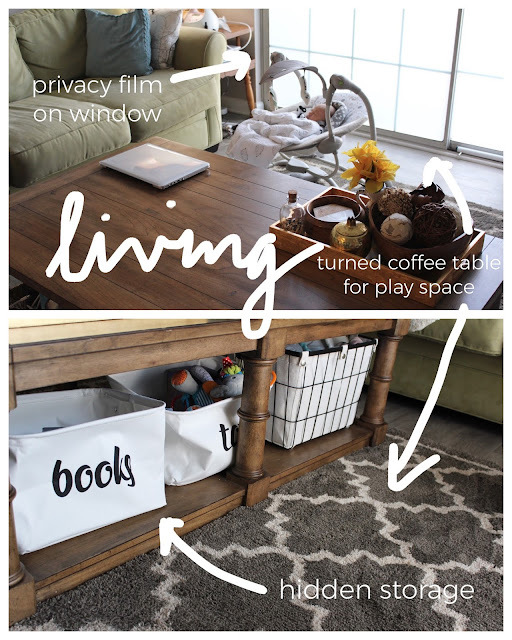 Usually there is a bunch of baby stuff on the coffee table during the day, but by creating designated spots for baby stuff we have managed to keep it pretty tidy in general. In addition, because I was craving natural sunlight, Dan put privacy film on the lower 2/3 of our patio windows, so I can see clearly outside when standing but be hidden when I'm sitting on the sofas nursing. Since we're on the first floor facing the parking lot, I really appreciate the privacy, and Kenny and I get good natural lighting all day. So there you have it! 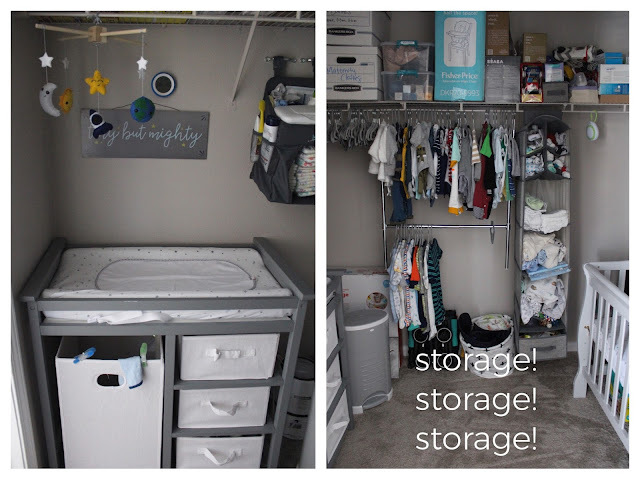 That's how baby has changed our apartment, and how we created a nursery in our closet. We like having Kenny "in" our room, so our family can stay in the other bedroom and visit us as often as possible. I'm sure once he is mobile and getting into things, we will have to childproof and adapt, but for the past couple of months it has worked for us.